So just to clarify, it's a pretty simple remove/replace type fix? Take the old part out, put new part in, done? So the car will cut off while driving? That can be pretty dangerous. Should have PM me, I have a few laying around. It is rare, but when they go, you get left dead on the spot. I just did mine last Friday. On some starts, Idle would be very low 400 - 500 RPM for a few seconds before coming up to normal. Based on all the treads, I did the CPS- All problems resolved. I am glad I did not wait for it to die. I just ordered one today as the problem just started happening for me. I got stuck at the driving range for about 20 minutes. I'm trying not to drive the car that much until I can get it fixed. Took her to a local repair shop and mechanic said he couldn't do it due to starter immobilizer kicking in if CPS removed. Since I've had part and tools ready I've decided to do it myself before work; 45 mins, $400 saved! Car runs noticeably smoother, rough shifting is GONE. Thanks a MILLION Shardul!!! I just finished replacing mine and it did not take long at all. I started the car a couple of times and the check engine light turned off. As long as you have the proper tools and instructions this car is easy to work on. I drove the car for awhile to heat the motor and tested it again. The car turned over quickly and before I changed the part it would take a few cranks. Now I am back on the love side of this love hate relationship with my AMG. ok so i got the symptoms , replaced it with a napa part and all worked for a day or two . today i am driving and give it about 75% throttle from the 1-2 shift and car cuts out , almost like it a trans problem and i can replicate it by doing a 1-2 shift in any trans mode . the car shuts off and will restart first try and have a cel on with a po335 code , no trans codes . any clues? Just thought I would chime in and report another...or rather another 2 successful CPS transplants. If you can believe it I got stuck in the garage (2003 E500) got the part from O'Reilly's and an E8 socket and went to work. Real tight with lots of blind touch and feel in there, used the twist-tie trick for putting back the screw and all was well. Yeeeehaa! 10 Days later Murphy decided to drop by and curse my wifes 2004 S430. She called me that her car would not turn over...I told here to wait and try again to make it home...Bought another CPS. This one although visible and with more approach sapace was a little trighter around the actual sensor. There was some kind of metal plate around the perimeter of the sensor which made it hard to maneuver around...but that plate saved me once from loosing the screw once or twice. This time I had to use and antenna magnet to get that screw out (while the sensor was stil in there). you see I try to loosen the screw first just over a 1/4 inch and then pull up the sensor then loosen the screw all the way then pull out the sensor with the screw still in the sensor but for some reason I almost lost it. Soooo.....when putting the CPS back in this time I could not use the Twist -tie trick because the metal plate would not give me enought room to pull the Twist-tie out afterwards. Sooo, to make a long story short I held the CPS with the screw in it with the socket extention but no rachet handel and hand tightened it. The rest is history....Phew!!! How many miles were in your car when the CPS went out? I experienced this close to 100K miles. It happened in Central Valley California where summer temps are always over 100F. So it could definitely be temperature dependent. FWIW the hall effect sensor used in the CPS is a typical and most vehicles use them. The ones on my diesel truck with triggered fuel injectors use a hall effect sensor. I don't think the MB sensor is any better or worse than anyone else. The location (rear of engine) and heat (radiated off the rear of the engine by the firewall) will affect the life of the semiconductors in the sensor. So It probably isn't a problem with sensor design as much as location. IF it were on the front of the engine it would still see heat from the radiator, sides of engine mainfold. So Heat is the enemy of the solid state device. And yes they can partially fail. They are designed to put out a square wave timing pulse that is used to time the plug firing. But in a partial failure mode instead of a square wave they could put out a saw tooth wave which might give a weak start. 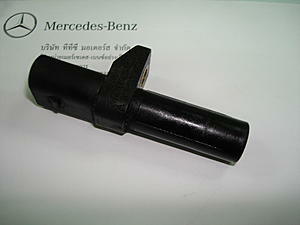 This might allow the engine to run but have difficulty starting. I certainly am not defending MB on this one (after all the other failures I have had ) but it is probably just a heat related/age failure more so than a MB issue with design of the sensor. Thanks to Shardul and other contributors to this thread. I read this site regularly but rarely post. For a while my 2005 E55 has idled rough and started taking longer to start. I attributed this to Houston heat and the addition of several recent mods including 82mm TB. Last night I finally threw a CEL after trouble starting and read P0335 "Crankshaft Sensor A Circuit Malfunction" w/OBD II. Searched this board and found these instructions. Not wanting to be down Labor Day Weekend, I picked up sensor at dealer this morning and an E8 at Autozone. Replaced the CPS this afternoon and car is running its best since I added TB and injectors a few months ago. Thanks for posting tips for rookies like me. Saves alot of research time when things like tools needed, sensor location etc...are shared by senior owners. One piece of advice, avoid dealer if you can. 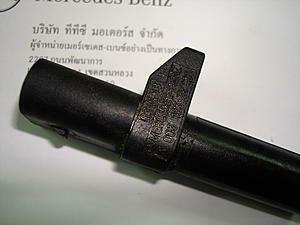 I was expecting $85 range but at Mercedes North Houston the cost of the CPS and a screw came to ~$210. Had I known this beforehand, I would have let car sit while I ordered it online. CPS failures are common on a lot of vehicles...I know on my F250 I drive regularly w/ the 7.3 Diesel I always keep one in the glove box. ford actually came out w/ a "new" CPS however it really didn't work any better. I agree w/ Vettedvr....the sensor location and the fact it needs a perfect signal every revolution of the motor to operate effectively....it's going to fail eventually. I would think a lot of other sensors in cars may not be working 100% either however their not as critical as a CPS sensor so their not noticed. Shardul and others , thanks for the tips and tricks on this DIY. It was a pain but better than paying the dealer or independent to complete the job. Thanks BBBSS and everyone for this posting. I replaced the CPS last year with BBBSS' help on the E55 then shortly after on the ML320. The E55 is still running good. However, the ML320 is starting to have hard start ... appears to be the same symptom but no error code ... yet. I took the CPS back to AutoZone and got a free replacement but the problem is still there. Could there be something else that causing it? Any comments would be greatly appreciated. 6/10/2014 - Updates: I finally fixed the hard start problem by replacing the fuel pump & filter. I'm still lost on how you get to it. You said the right side fender, but I'm not understanding the angle of the picture. Do you mean that side but through the engine compartment or from below or that I have to take the wheel off. Wow, that was fast. Thanks! Parts and tools today, fix this weekend. Just had this happen to my car. Frikking 150$ from Partsource in Canada and I couldn't wait for online since my car is DD. The pics in the first post are gone away. Do I need to take off the Air filter cover ? Do I need some sort of special screw to put it back in ? Anyone has other photos ? You reuse the bolt that was holding the old one in. The part number was given in case you drop/lose the bolt as it's a bit of a pain to get it back in without dropping it. Follow the lead of others with wrapping a tiny bit of tape or something around the bolt to help hold it in. Also don't just slam the sensor home with the bolt taped in place, this isn't that girl from Bangkok, get it part way in and try getting the bolt started carefully. Once you get the bolt started some you can seat the sensor fully and snug up the bolt. Snug, don't get crazy with it. Removing the airbox assembly (the box is held in by a couple tabs that push down into a rubber lined slot (Remember that girl from Bangkok??...) If you are having issues getting the airbox off you can unbolt the top and pull the filter out and try to pull the lower off separably, this usually goes a bit easier but is more work. 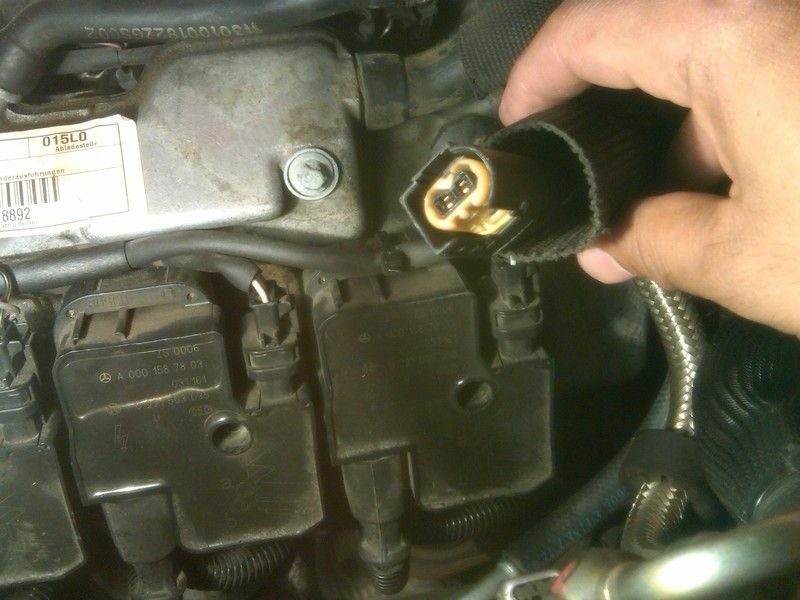 You should be able to just pull the hose that leads to the front of the car off the front of the airbox carefully and wiggle the airbox while you pull it up to get the box loose without splitting it open. If the airbox doesn't seem to want to come out don't get crazy, you don't want to break the tabs off or something like that. If it's really being a pain just pull the bolts out and take the top off the box, remove the filter and the bottom will come loose much more easily. Last edited by BBBSS; 05-02-2013 at 08:56 PM.